This is a cry for help. M&Ms are taking over my life. I need help. Or someone to take the bag away. 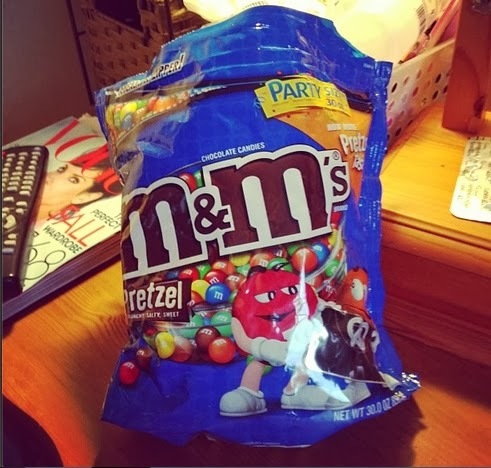 That’s right, I went to Orlando for two touristy-packed weeks and at the top of my check list of things to buy, above jeans, Converse, etc, etc, were pretzel M&Ms. It all started many moons ago when my old American boss (that’s right Alexis, I’m blaming you) started shipping us boxes of candy from New York. I’m a sucker for a sweet and salty mix and these little pretzel nuggets covered in chocolate, suckered me in. When I stumbled hunted down the candy aisle in Wallmart, I knew exactly what my crazy eyes and grumbling stomach were looking for. But no, an ordinary sized bag just wouldn’t do. I had to buy the party size bag. FOR MYSELF. What can I say, my inner fat kid came out. I’m still not planning on sharing. Get your own off Amazon. But beware, they’re £40!!! I only paid $10. Cue evil laugh. Mwahahahaha. "Lulu Guinness Has Her Eye on the Prize"
"3 of the Best Tartan Midi Skirts on the Web"
I LOVE these, I always beg people to bring me some back when they go to America! I am such an addict. My boyf had to restrain me otherwise I would have filled a full suitcase with them!